The wood chip pellet machine is the new biomass energy equipment. It is the pelletizing equipment for wood pellet production. The raw materials are usually eucalyptus wood, birch, poplar, fruit tree, bamboo shavings, crops straw and etc. Through crushing, drying, screening, pelletizing, cooling, packaging and some other processes, the raw materials will be molded into wood pellets. The finished products are usually used for the biomass power generation, boiler, fireplace, household heating stove, etc. We have the ZLSP series wood chip pellet machine with different models. The ZLSP series machine is the flat die pellet machine, it is independent researched and developed by our technical personnel, with the intellectual properties of biomass energy machine. The machine features simple structure, easy operation, stable running, continuous working. The machine is equipped with high precision gear transmission gearbox. The hydraulic oil system can input gasoline by the automatic cycle between the gearbox and the spindle bearing. When the machine work, the oil transfer pump continuous work, the cycle of engine oil can prolong the service life of the main shaft and transmission gear. The working parts of the machine(roller, the mold) adopts alloy steel material. After heat treatment processing, the hardness can be more than HRC50, which can guarantee the continuous working and prolong the service life of the whole machine. The working of a wood pellet machine includes a series of process, as following: the motor drive the reducer, the gear reducer drive the main spindle, the main spindle drive the roller frame to revolve, the roller rotates around the main spindle while revolves around its own axis. The press roller and the pressure molding clamp and compress the material into the die hole by the relative movement, and forming pellet through the die. The size of final pellets can be adjusted by changing the hole size of the flat die. Where can wood pellets used? Wood pellets is a kind of Biomass molding fuel, a new type of biological energy. It can replace firewood, coal, oil, liquefied petroleum gas, etc, which is widely used in heating stove, hot water boilers, industrial boilers, biomass power plant, etc. Home heating: High combustion efficiency. Easy to store. Industrial boiler: used as the main fuel in industrial boilers, replacing coal-fired, relieve the environmental pollution. Power generation: can be used as the fuel in thermal power plant. Forestry waste: Wood waste, branch, palm tree, sugarcane residue, sawdust, medical slag, hay. Crop waste: Bean stalk, wheat stalk, corn stalk, cotton stalks, sunflower stalks, mustard stalk, rice stalks, coffee husk, cotton shell, peanut shell, rice shell, coconut shell. Organic waste: Livestock and poultry's waste, tea waste, wood chips and many other organic waste resources. We manufacture the machines in accordance with the European standard. All of our machines have passed CE certificate. Our flat die pellet machine is for pressing biomass materials into solid pellets which is for burning or animal feed. You can use nearly all kinds of biomass as raw materials, such as agricultural waste, straw, fodder, forestry wastes, lumber leftover, sawdust, wood chips and so on. As for the power, you can choose the gasoline engine driven, diesel engine driven or electric motor driven. And we have many different models and outputs, they can meet different required capacity. 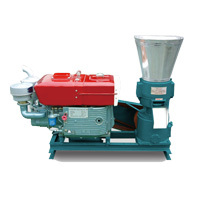 Our pellet machines are ideal pellet press for personal, family and small plants. They are very easy to operate and maintain. 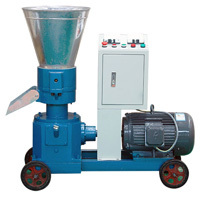 ZLSP series pellet machine is one of our latest updated models. It is specialized in making wood pellets. Unique design for motor and gearbox, new roller rotating instead of previous die rotating. More than 20% increase in output capacity than old models.